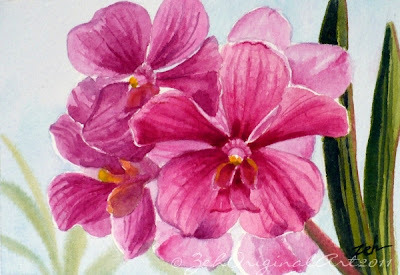 "Pink Orchids" original watercolor - for sale in my Original Art Shop! The inspiration for this watercolor was lovely pink orchids from the Foster Botanical Garden in Honolulu. When we entered the Gardens, the person who sold us the tickets suggested we start with the orchid gardens. At first, I only saw the green foliage of palm trees and tropical shrubs. But wandering through the pathways, marvelous orchids appeared around every bend like these pink beauties.